During the total Solar Eclipse on August 21, 2017 Nibiru and its Moon Swirls made an appearance. 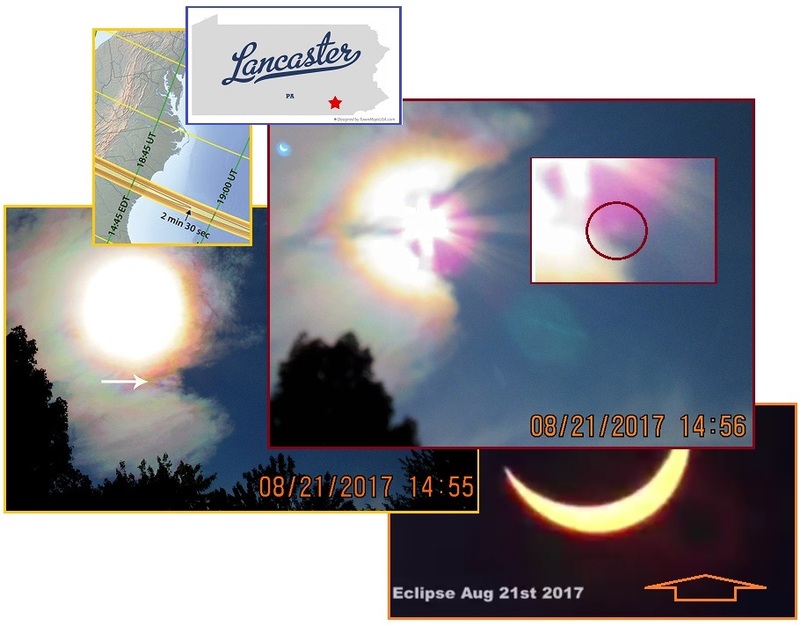 Juan in Lancaster, Pennsylvania caught Nibiru at the 5 o’clock position to the Sun. A distinct Nibiru! The timing was late, the photo time stamped 2:56 pm when totality was supposed to occur at 2:30 pm. 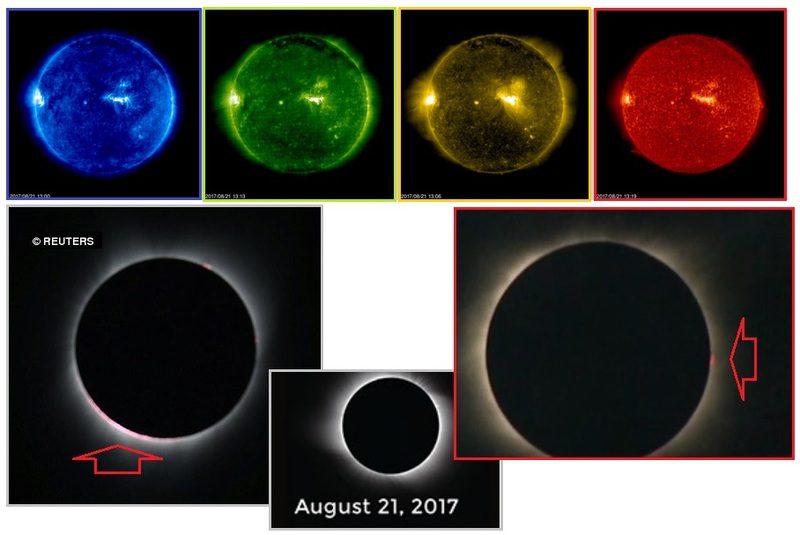 A ghost of the eclipsed Sun can be seen in these captures, confirming the degree of totality and the angle of light coming from the Sun. Nibiru showed up on other private captures too, at the 5 o’clock position, confirming Juan’s capture. When the glare of the Sun was removed by the Eclipse, the Moon Swirls of Nibiru showed up as they do in filtered photos below and to the left and then above the Sun. 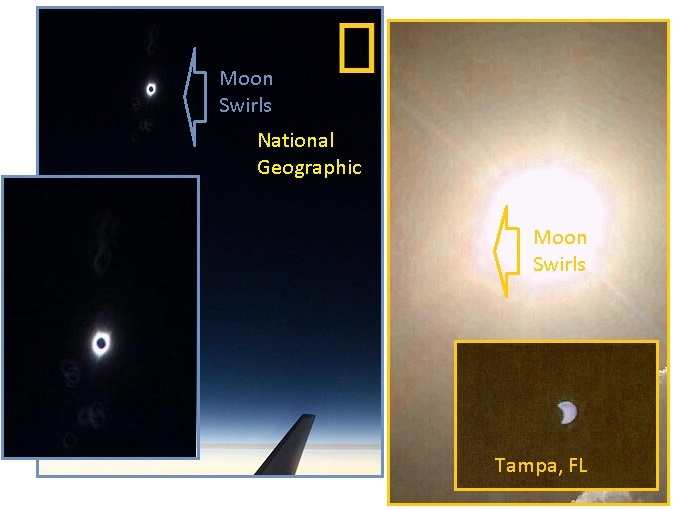 This can be seen in a National Geographic photo taken from a plane, when no clouds are evident, and when the glare at the left side of the Sun is reduced by the Eclipse in a photo from Tampa, Florida. There should be less glare from the Sun on the left side of the Sun, in Tampa, yet when the Sun is darkened, thus more is revealed. Though NASA used filters strong enough to block out the stars, a red light peeked around the edge of the Moon at the 3 o’clock position where no sunspot or CME existed on the placid Sun, per a photo from WLOS in North Carolina. Likewise on the left of the Sun, where the Moon Swirls of Nibiru waft. If this light is not coming from the Sun, then it is coming from Nibiru and its Moon Swirls! 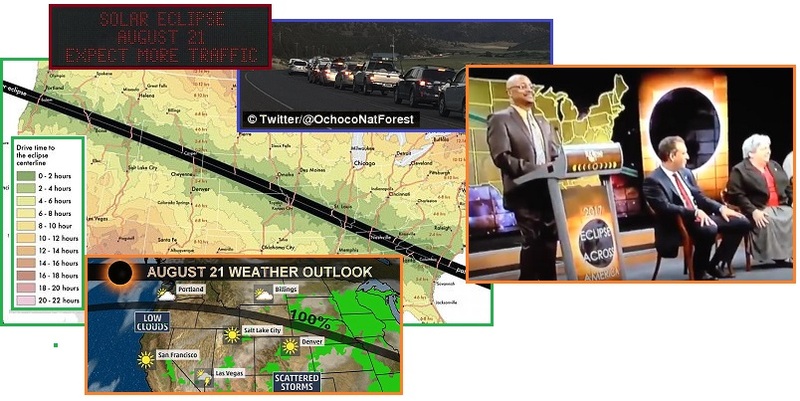 Steve Olsen streamed live from his home located at an eastern Oregon/western Idaho area. The eclipse was right on schedule for that location, totality arriving at 10:28 PDT. 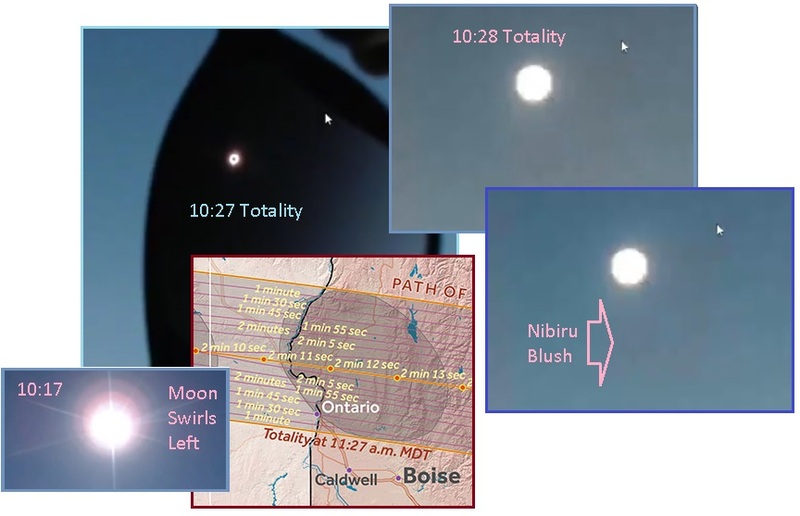 A distinct blush where the Moon reduced the glare of the Sun is evident, first on the left hand side where the Moon Swirls ride, then at the 5 o’clock position to the Sun, where Nibiru is located in the view from the Northern Hemisphere. 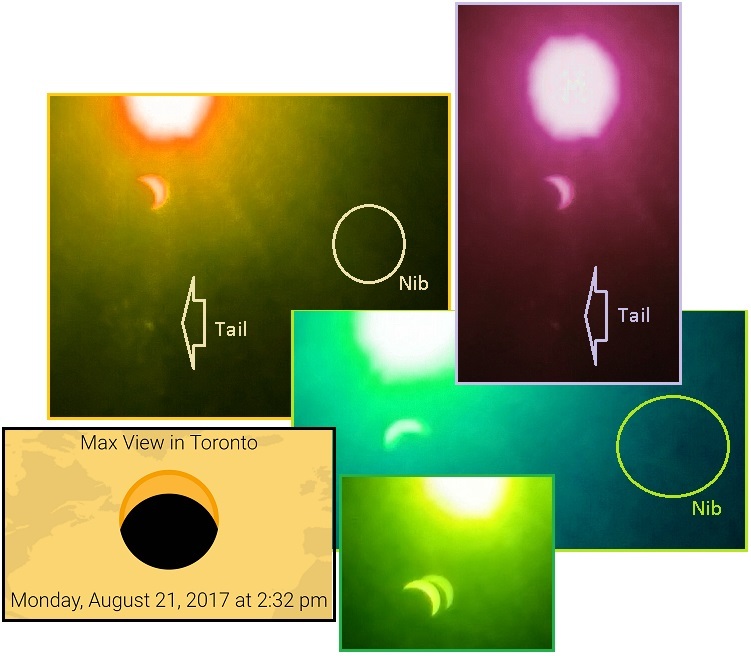 The ghost image of the eclipsed Sun that appears in many images was dramatically shown by photos from Malahide, Ontario, as most of them have a double ghost. The filter used was a welders lens, which often filters out evidence of Nibiru as well as the glare of the Sun. But evidence of Nibiru at the 5 o’clock position to the Sun is there, as is the drifting tail wafting to the left of Nibiru. As noted in a photo from Grand Blanc, Michigan the totality was greater north of the predicted path, as these photo from Ontario show a greater totality than expected. A series of unfiltered photos from Denver, Colorado show what a close examination can reveal. At first glance, nothing seems to be there, but when checked after a color invert, or if hue enhanced, there lies Nibiru and a distinct Moon Swirl. Nibiru shows a shadow away from the Sun side, showing it lies between the Earth and Sun and somewhat to the right. The Moon Swirl shows up distinctly on a color inversion, showing that the entire swirl is emitting light, not sunlight reflecting off local clouds. Due to the Earth wobble, which shoves the globe into a Figure 8 daily, the path of the eclipse was not likely to be as predicted. 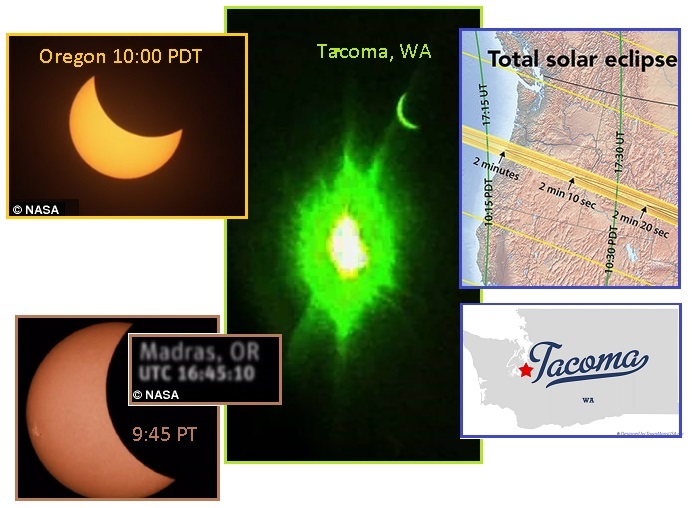 Tacoma, Washington is near the Seattle area, and not in the path of 100% totality. Yet in photos from Tacoma the totality seems almost complete, and the Moon is eclipsing the Sun in a straight left to right manner whereas in the Madras, Oregon area, the Moon is eclipsing the Sun atop the Sun, not straight on. The path is wrong. The total solar eclipse began in Oregon at just after 9am PDT where the moon is slowly making its way across the sun, blocking it completely within a few minutes. 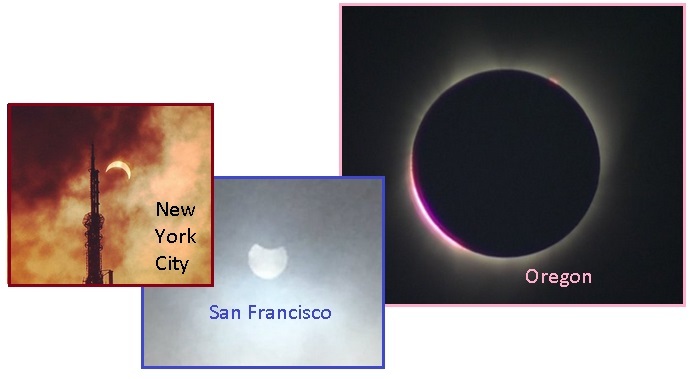 Oregon has caught its first glimpse of the celestial event-of-a-lifetime, as it begins to sweep across the US. A shot of the eclipse taken from Madras, Oregon, at around 9.25am PDT. In photos from Grand Blanc, Michigan at 2:21 pm, the eclipse has more totality than expected, and looked to the photographer like a Zeta face winking. In a photo capture from Tampa, Florida at 2:03 pm, the eclipse can clearly be seen in a camera ghost of the Sun, but totality is less than expected. The photographer was confused by the ghost image, a camera lens effect, as it looked like a crescent Moon. Look what I caught. I saw the (to me) Zeta face when I was taking the pics. I didn't realize this until I looked at it later. The sun and moon eclipsing in one eye with a hand shadow with long fingers. This pic was taken by our son walking home from school. He asked me if that was the moon in the sky. Look closely it's partially obscured by something. Wasn't sure what it is. This was taken about 2:00-2:03 as he was walking home. A report from Davidson, North Carolina shows the eclipse as reflected on the garage. The angle is wrong, as the Moon should be showing the Sun above the Moon, but the Sun instead is seen below the Moon. Here are photos I took during the height of the Eclipse in Davidson NC. If you zoom in, I captured the reflection of the eclipse on back of my garage. 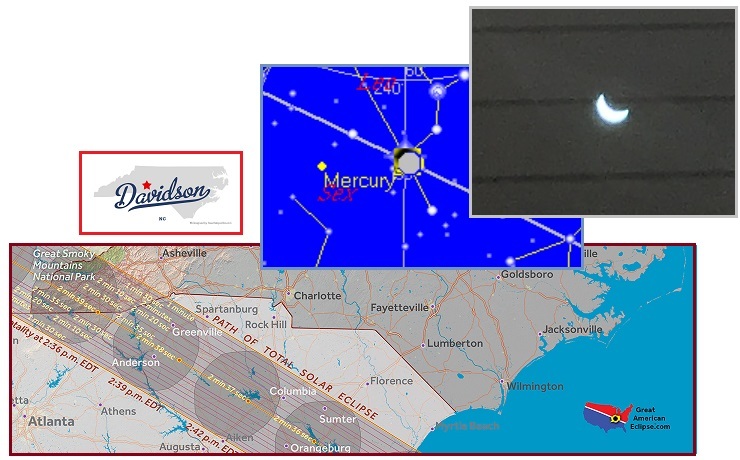 Aware that the path and degree of totality were skewing as the Eclipse moved across the continent, conservative North Carolina took steps to avoid showing this. Franklin, North Carolina is on the border of North Carolina and Georgia, where totality was expected. WLOS, ABC News 13 out of Ashville, chose to show NASA photos rather than local photos, though it appears such local photos would have been available. Instead, they emphasized rain that fell elsewhere. Expectations were being lowered going into the August 21, 2017 Eclipse. The public was told to expect heavy traffic and bad weather and to be cautious about looking at the sky even if it is cloudy. 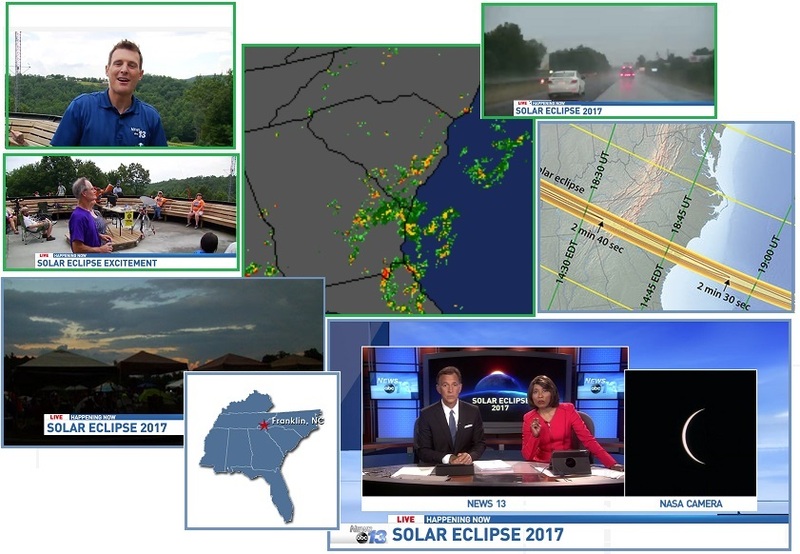 The public is being encouraged to stay home and watch on TV, the eclipse streamed from elsewhere, including from a balloon in the sky which could be moved if the wobble affects the path. 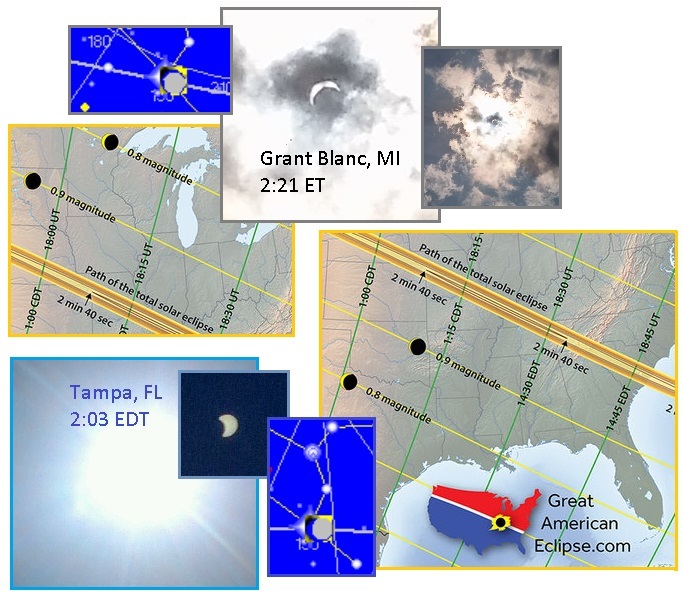 During a presentation by the Eclipse Across America group, the speakers kept doing a Freudian Slip, inserting October 20 as the date instead of August 21. The Zetas explain. Oregon is hosting dozens of festivals, which is quickly mounting to a headache for local residents in small towns not prepared for millions of visitors. Parts of Middle Tennessee are within the path of totality, which means thousands of people will have flocked to the region. The TDOT is concerned that people might stop in the middle of the road to watch the eclipse. Next week's solar eclipse will be streamed live online for the first time, from the vantage point of helium-filled balloons across the United States, providing the public with sky-high views as the moon blocks the sun. ZetaTalk Insight 8/31/2017: This is not NASA or any official government agency speaking. They have heard discussion about the path on August 21 not being correct, but more akin to the path that might be expected on October 20. The Northern Hemisphere normally tilts away from the Sun as the Fall progresses, with the Sun dropping lower on the southern horizon as Winter approaches. With the daily Earth wobble, the magnetic N Pole gets a push away when the Sun is high over the Pacific. This is when the magnetic N Pole, now over Siberia, looms up over the horizon. Thus for the East Coast of the US, the globe may get a push skewing the path at this time. The path may run lower, and this occur for much of the US as well. These individuals on the video did not get an explanation for this rumor, nor confirmation or denial, so are in a knot about it. 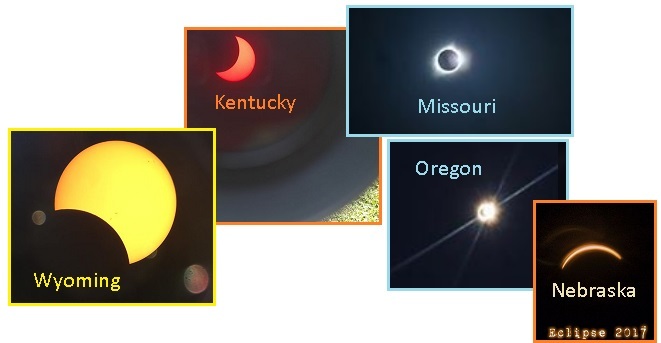 The Solar Eclipse of August 21, 2017 did a rapid race across the continent, with exacting times and locations for the path of totality known. Because of the Earth wobble, the globe is in the process of dropping the N Pole when the Sun is over the N American Continent. Thus the path was wrong, giving better totality to those above the predicted path, and less totality for those below the predicted path. 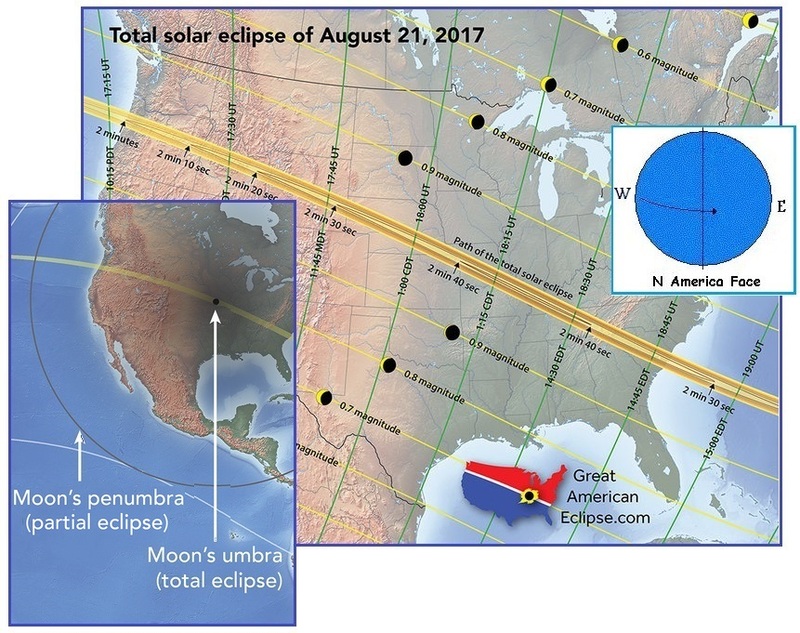 Scientists said Monday’s total eclipse would cast a shadow that would race 2,600 miles (4,200 kilometers) through 14 states, entering near Lincoln City, Oregon, at 1:16 p.m. EDT, moving diagonally across the heartland over Casper, Wyoming, Carbondale, Illinois, and Nashville, Tennessee, and then exiting near Charleston, South Carolina, at 2:47 p.m. EDT. Shawnee National Forest in southern Illinois was in line to see the longest stretch of darkness: 2 minutes and 44 seconds. Chemtrails were being heavily sprayed, as was noted on a GodlikeProduction message board. Another GodlikeProduction thread noted that the NASA feed and other live feeds were dropping or cutting out at crucial moments. It seems they only wanted to public to see their packaged conclusions, not reality. The path was not correct, thus the percent of totality predicted was not correct, and yes, Nibiru did show up! Woke up to a mess of chemtrails here in KY.
NE Washington, looks like it will be clear with a little bit of chemtrail haze left over from yesterday when they were out in full force. Doesn't it seem like the chemtrails are a bit worse today in NJ? Every news feed in the UK cut away from the final slither of sunlight straight to NASA's live feed of totality. Any television station under the shadow will have a feed. We are 11 min. shadow time before Charleston, SC! 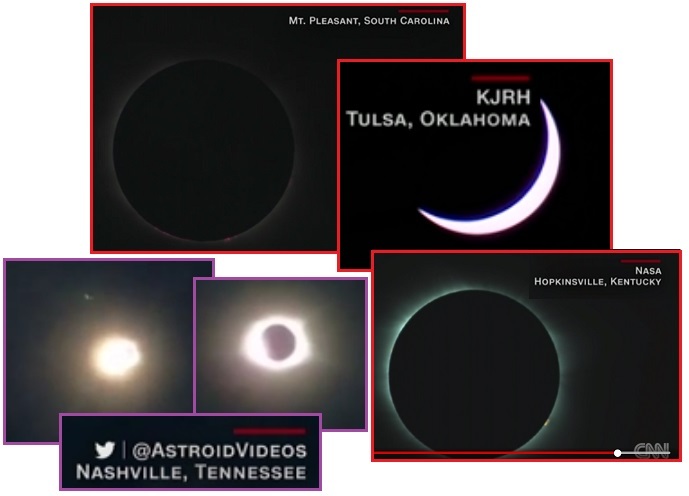 Every camera cut out on the moment of totality even Slooh feed glitched for the full 2 minutes the only live one was a NASA feed. Even the live feed just now on Sky did the same. In Salt Lake City I only saw about 60% eclipse rather than the 93% advertised prior? How much of the Nibiru complex did the Main Stream Media allow? They predictably played it safe, although a hint of the brightness where the Moon Swirls ride was allowed in a Fox News photo. NBC had an interactive map of images sent in by the public, which was primarily of the crowds wearing glasses. 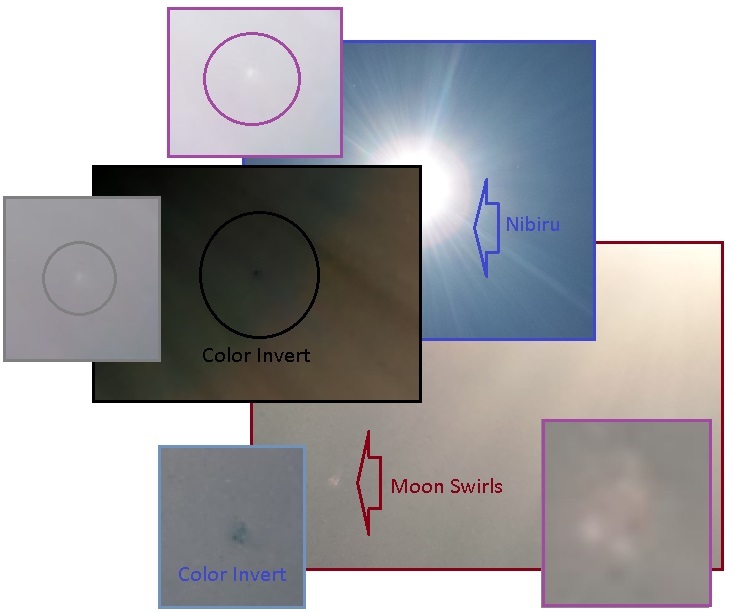 Of course, these shared cell phone images were carefully selected to exclude any real evidence of Nibiru. Most media images provided were from NASA. Unless you are flying a fighter jet, you won't be able to follow the shadow, which will be traveling at almost 3,000 miles per hour when it enters the US and then slow to nearly 1,500 mph when it traverses South Carolina. Below is a map of real-time Instagram uploads by folks who had the best seats in the house. Click on the dots to see what people saw through their smartphone lenses. Americans with telescopes, cameras and protective glasses staked out viewing spots along a narrow corridor from Oregon to South Carolina to watch the moon blot out the midday sun Monday in what promises to be the most observed and photographed eclipse in history.